September is here, where did the rest of the year go? Welcome readers and friends, we’re finally in September and there’s plenty of news and events to update you on. First off I would like to announce the start of the new gallery season at 1Spot Gallery. 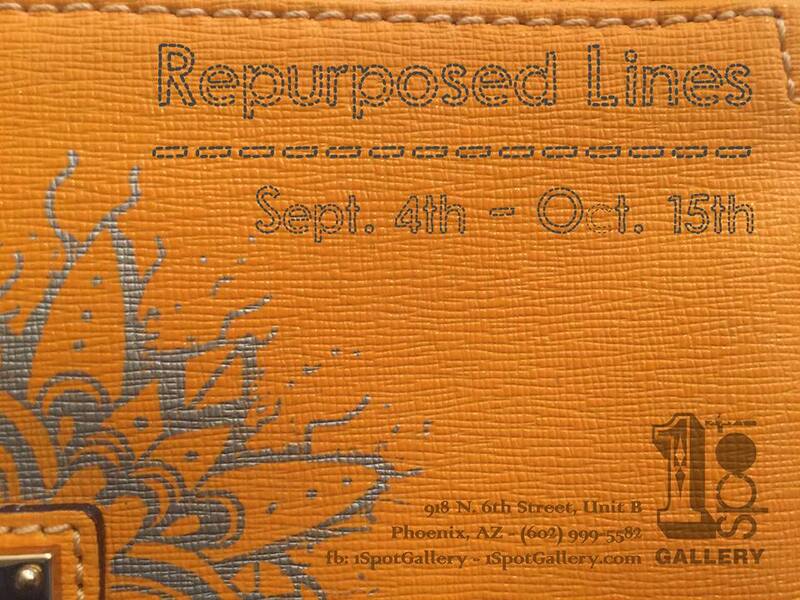 “Repurposed Lines” will “showcase objects and drawings originally created for a specific audience, which have been enhanced through line work to appeal to a different clientele. The repurposing I’m doing involves handbags, and mens/womens shoes, embellished with hand drawn line work done in my unique style. The lines in this case refer to the product line and the lines being used in the repurposing process. This event will go from 6-10pm on First Friday, and 6-10pm, First and Third Friday in October. 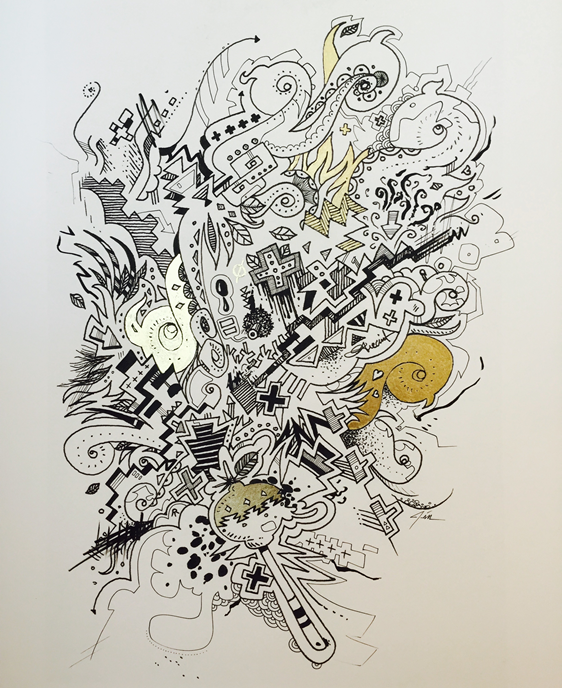 As part of this show, I will be debuting a series of 6 ink drawings that are hand colored on bristol board, along with new digital prints that have been expanded upon by utilizing line work and color, and modified photo-mechanical offset litho prints (I tried to find a suitable art term, but came across no standard definition of this process). 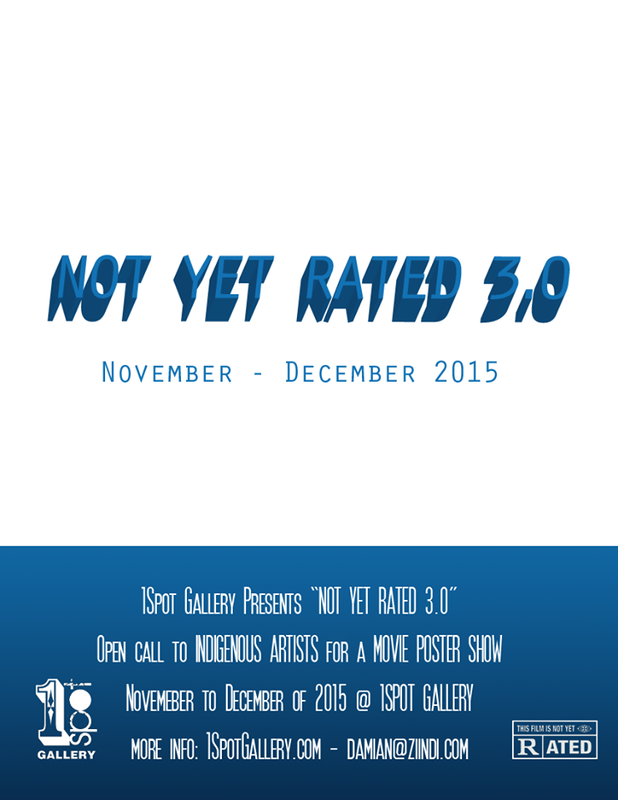 With this new show, we are looking forward to the Movie Poster show in November/December, “Not Yet Rated 3.0”, which is still open for submissions. 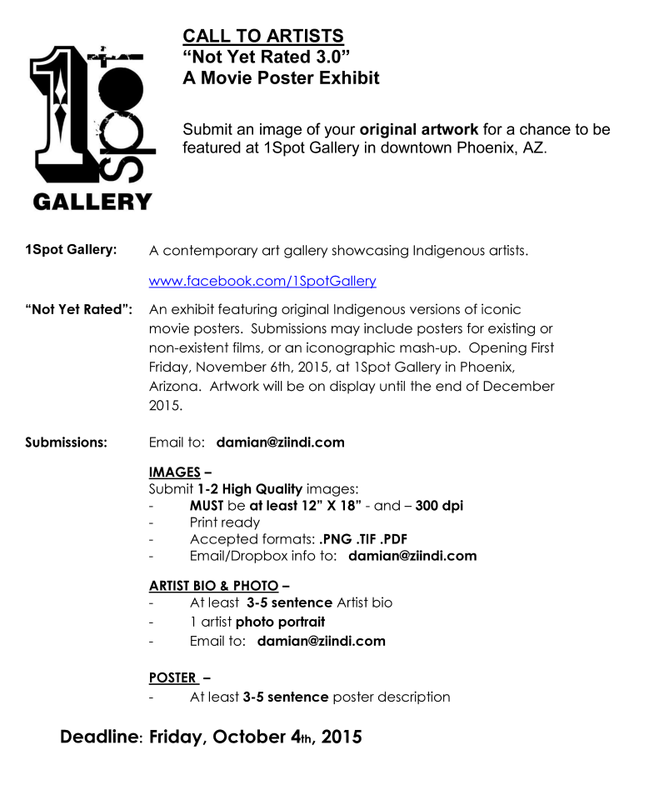 The deadline for final submissions will be Sunday, October 4th, 2015, despite the typo on the Call to Artists form. We’re looking forward to this show and to the amazing art that is generated from this annual show. Last month was also Santa Fe Indian Market, in Santa Fe, New Mexico. This year I was invited by the Southwestern Association for Indian Arts (SWAIA) to participate in a new exhibit titled, “Indian Market Edge, Contemporary Art Exhibition” held at the Santa Fe Convention Center during the market weekend. I was asked to display 3 digital pieces, “Mechanica II“, “Happy“, and “New Paradigm.” The opening night was hectic, however Mechanica II sold to a collector in Santa Fe. 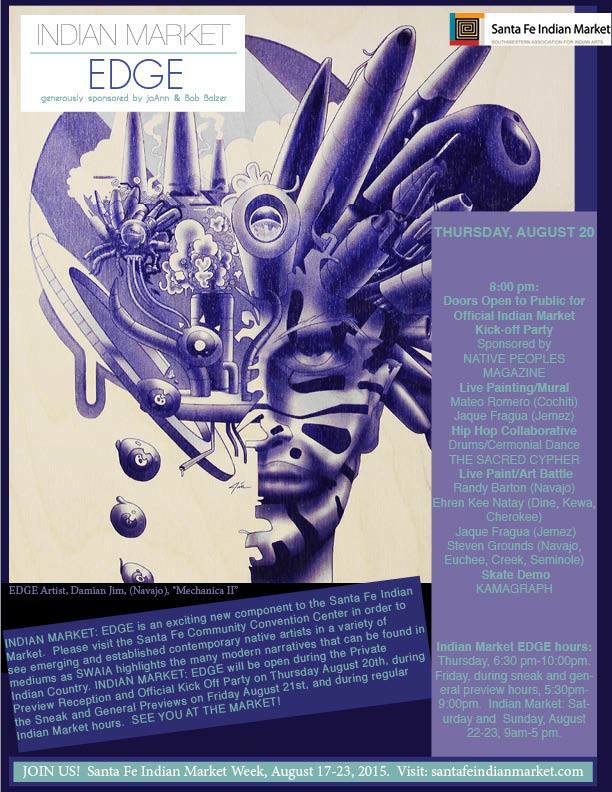 The opening festivities consisted of live art and live music by several DJ’s, including Randy “Boogie” Barton, fresh off his whirlwind market experience. Overall the event was a great insight into professional gallery presentations on “edgey” native art. Thank you to SWAIA for the props, and the opportunity. With all the openings events going on, the artist booth at SWAIA and IFAM, mountain biking in high altitude, gnarly food, and plenty of visiting friends, Katja and I were both tired by the end of the weekend. And now for the last bit of news, starting September 1, 2015 to November 1, 2015, the Fondazione Giorgio Cini in San Giorgio Maggiore, Venice will feature: Imago Mundi – Map of the New Art, Featuring artwork of the Indigenous Native Americans. 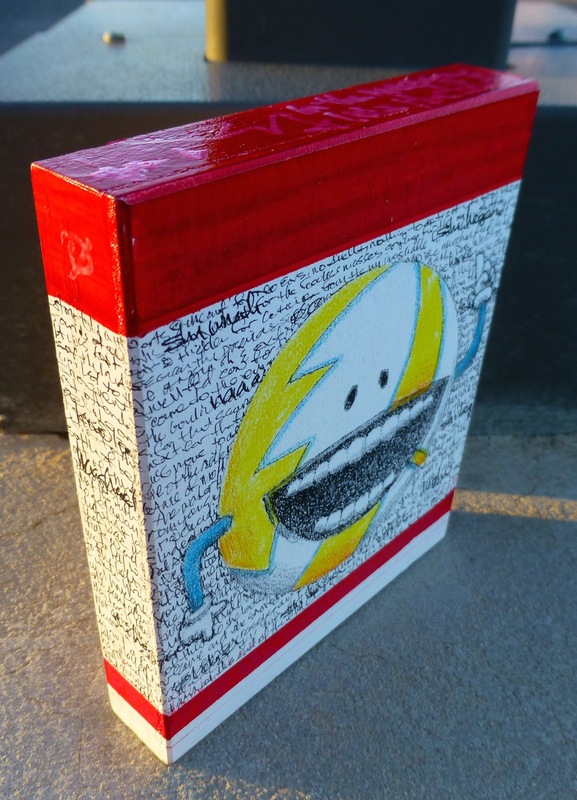 I mentioned in a previous post about participating in this world wide project with a small mixed media painting titled “Read Between The Lines“. I will have the opportunity to pop on over to Venice for a few days during my vacation, and we plan to check out all the great exhibits during the annual Venice Biennale. An addition that emerged from this project is the accompanying coffee table book that showcases all the artists involved in the North American Natives collection, as well as the pieces submitted for the project. The book looks primo and can be purchased at Fabrica. There will also be a new t-shirt print coming out, “The Visionary” will have limited availability, along with a limited giclee’ print run of 3, make sure to snag these before they disappear!! Welcome back to the gallery and I hope to see everyone on Friday!! !